Description (ebay): Over-The-Door Hook Rail,No 44002, Interdesign, 3PK Interdesign 44002 081492440024. Classico over-the-door rack. There are 6 hooks to hang clothes on. Over-The-Door Hook Rail,No 44002, Interdesign, 3PK Interdesign 44002 081492440024. Classico over-the-door rack. There are 6 hooks to hang clothes on. This over door storage rack creates practical organization wherever you hang it, and the versatile design makes it perfect for anywhere around the home. Providing extra hanging storage in seconds, the hooks can be hung in bedrooms, kitchens, hallways, entryways, garages, and bathrooms - simply hang over any standard interior door - no hardware required. 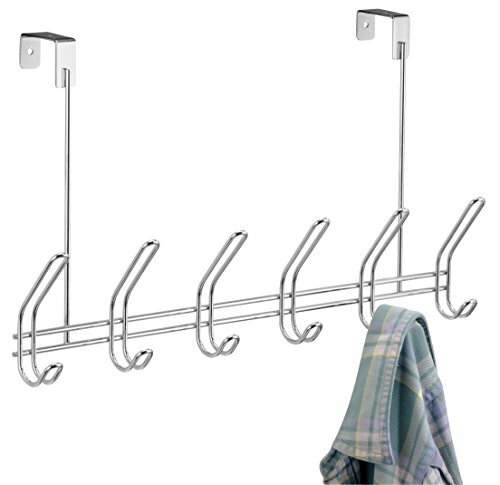 Equally suited to storing jackets, hats, leashes and coats by the door, or bath robes and towels in the bedroom, the sturdy, durable hooks will keep your home tidy and organized, and the portable over door rack design allows you to remove and relocate the storage organizer hooks as needed. InterDesign’s creative products enhance your décor, turning simple home solutions into must-have elegant accessories that shine. Designed in the USA, we are proud to produce a wide selection of high quality home, bath and storage solutions that excite, inspire and charm. Stylish, functional and affordable, our products have been enriching customers’ homes for over 40 years. InterDesign: innovative products, exceptional value.